Anne Salisbury, Gregg Braden and Greg Meyerhoff meet up in Denver! We have followed Gregg Braden’s work since the late 1990s when he came out with his first book of twenty well-received books. In 2002, we attended his event in Albuquerque and came to know him and his kind mother. My mother was with us also, so it was a family affair. 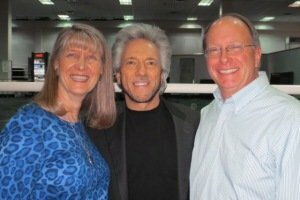 Greg and I live in the mountains west of Denver, CO, which is where Gregg Braden used to live. And Gregg’s family and mine are all from the Kansas City, MO area, and we know some of the same fascinating people there. For example, Gregg met Harry Truman in his hometown of Independence (a suburb of Kansas City) when he was six. My grandfather’s tailor was Mr. Truman’s old WWI Army buddy. Truman would come visit his friend’s tailor shop, sit on the table swinging his legs and chat while my grandfather was being fitted for his suits. It is fun to see how paths can cross and connections are made in unexpected ways. Gregg Braden is a scientist who researches ancient civilizations to glean their wisdom and merge it with the best that science offers today. Gregg is genuine in his desire to bridge science and spirituality. He encourages us accept the “new normal” by explaining the wisdom of the ancients. By being willing to embrace change and be creative in our response to stress, we become resilient. This is the key to approaching the upcoming “turning point.” There is no going back to the old ways of being, so the more resilient we can be, the more enjoyable the ride. 1. Shift your awareness from your brain to your heart. You can do this by touching your hand to your heart. 2. Now, shift your breathing. Slow it down to 5 seconds in and out. This shift in your breathing signals to your brain that something has shifted. It also creates heart/brain coherence (0.10 hertz) that opens your intuition. This resonance bypasses the filters of the mind. In this place you can create anything you desire. It opens the space between the heart and the brain where you can insert new feelings. 3. Insert regenerative feelings of caring, gratitude, compassion and appreciation. This brings about healing and wholeness within you. By doing this three times a day for only 3 minutes each time, you will increase your resilience and willingness to embrace change in a healthy way. 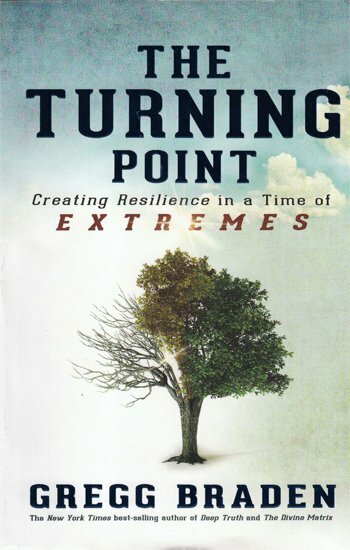 To learn more, check out Gregg’s newest book, The Turning Point: Creating Resilience in a Time of Extremes. As he says, “There’s a time when every crisis can becoe transformation; when simply surviving can become joyous thriving. In our lives that time is the turning point. In our world that time is now. Listen now to the interview with Gregg Braden interviewed by Anne Salisbury, PhD and Greg Meyerhoff of GoIntuition.com. Listen to Gregg Braden Gregg Braden – Become Resilient in Time of Extremes by clicking below. This is a 36 minute audio file. visit GreggBraden.com for Gregg Braden’s schedule of events and information on his books, including his newest book, The Turning Point: Creating Resilience in a Time of Extremes. visit TranspersonalHypnotherapy.com for information on how you can access your creative, intuitive mind through Transpersonal Hypnotherapy.